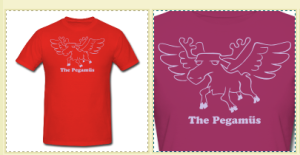 I’ve finally added “The Pegamüs” shirt to my store. The Pegamus knows what you’ve done. There are currently only two options for style and colors, but the shop is very flexible and allows you, the buyer, to select the color of your choice. If there is a shirt style you prefer, please send me an e-mail request and I’ll post it in the store.